KANSAS -- The attorney for a woman whose Rottweiler dogs mauled a boy to death two years ago as he waited for the school bus argued Tuesday before the Kansas Supreme Court that the woman's conduct didn't rise to the level of murder. Keith Sevedge, of Lenexa, who represents Sabine M. Davidson, told the state's high court that Davidson was asleep on a couch when her three Rottweilers escaped from their fenced compound and killed 11-year-old Christopher Wilson on April 24, 1997. But Geary County Attorney Chris Biggs, of Junction City, said there was considerable evidence presented during Davidson's trial that showed the dogs were dangerous to children, that neighbors had complained to Davidson frequently about the dogs and that the animals had been trained to fight. "There were lots of warnings," Biggs told the court. "She knew the dogs were dangerous toward children." Her response to complaints about the dogs was to laugh, he said. Biggs argued that the evidence was sufficient to support the Geary County jury's verdict. Sevedge urged the court to overturn Davidson's conviction for unintentional second-degree murder and return the case to Geary County District Court for a new trial with instructions that the maximum charge be involuntary manslaughter. "I find it incredulous that my client was convicted of this crime," Sevedge told the court. He said if Davidson had commanded the dogs to go after the boys, that might arguably be the basis for a murder charge. However, Biggs noted the jury in the Davidson case had received an instruction from the judge on involuntary manslaughter, but chose to convict her of the more serious unintentional second-degree murder charge. A decision in the case is expected to be handed down July 9. Davidson, 29, also was convicted of a misdemeanor count of criminal endangerment of a child younger than 18. 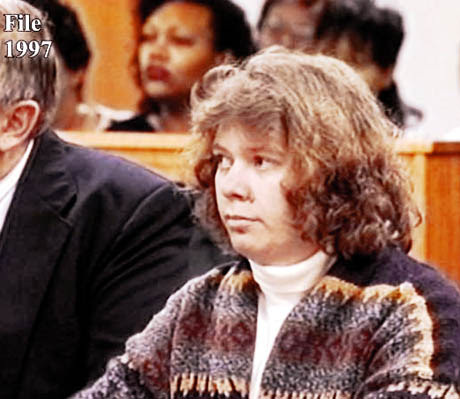 In March 1998, Davidson was sentenced to 12 years in prison on the second-degree murder charge and to one year on the child endangerment charge, with the two sentences to be served simultaneously. Davidson's husband, Jeffrey, also was charged with unintentional second-degree murder and criminal endangerment of a child, but he pleaded no contest to a reduced charge of involuntary manslaughter in April 1998 and received a sentence of five years probation. He is not allowed to own dogs during this probation period. After Tuesday's arguments, Sevedge said his client had been free on appeal bond since the trial and sentencing, but he declined to say where Davidson lives. Brian and Violet Wilson, the parents of Christopher Wilson, attended the arguments on Davidson's appeal to be there for their son, they said. The attack on Christopher Wilson occurred as he and his 9-year-old brother, Tramell, waited for a school bus about a block from the Davidson home in the Country Meadows housing development near Milford Reservoir, northwest of Junction City. 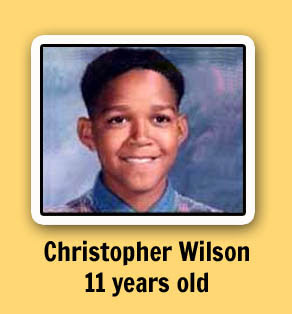 Christopher and Tramell Wilson had climbed a small tree at the edge of a ravine to escape the three Rottweilers. When the dogs moved on, Christopher jumped down to see where they went. He was caught and killed just as the school bus arrived. He suffered two fatal bites, one broke his neck and another tore his carotid artery.